Fundraising and Alumni Event in Pasadena! Alumni Carla Lazzareschi (’70), Ron Lin (’04), and Larry Wilson (‘77) are kindly hosting an event from 3:30-5 PM on Sunday, April 15, at the Gamble House in Pasadena. 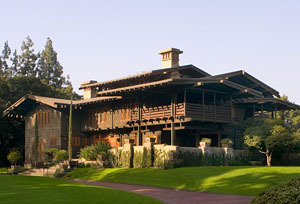 Take advantage of the chance to mix and mingle with Southern California alumni, and see the beautiful Gamble House— a historic Arts and Crafts-style landmark from architects Greene & Greene. You might remember the home as Doc Brown’s house in the 1985 movie Back to the Future. There will be complimentary wine and snacks, as well as tours of the House. Featured speakers are alumni David Lazarus and Jim Rainey, both Los Angeles Times writers. Student editors will also be attending to tell about what is happening at the Daily Cal now, including the upcoming move out of Eshleman Hall. Tickets are $35 per person, which includes the cost of the house tour and the wine, and will help raise funds for the Daily Cal. Please register now to reserve tickets or leave a donation to help defray the costs for students joining us from Berkeley. Feel free to forward this invite to other alumni. Welcome to our brand new Donations website! It’s finally time that people know more about The Daily Californian in its existence as a nonprofit organization giving students the opportunity to gain experience in journalism, advertising and media. That’s what donate.dailycal.org is all about. On this website, there is information not only on the different ways to support the Daily Cal, but also on how our organization is structured, and who leads us to being an award-winning newspaper. Take a look at our history, and you might come to understand why donations to the newspaper are so important: The Daily Californian is — and has been — the voice of Berkeley, and is now the city’s only independent newspaper. Thank you for coming to donate.dailycal.org, and thank you for your generosity.